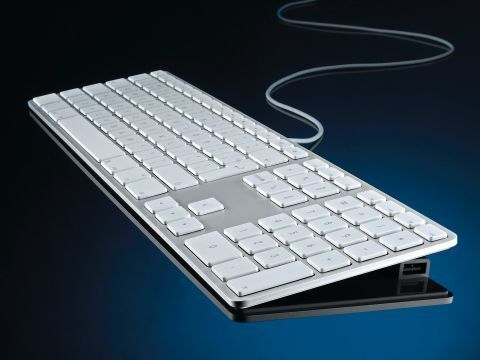 Apple has finally done away with its chunky old keyboard and replaced it with this super-slim aluminium upgrade. The new board comes bundled with all iMacs and Mac Pros, is available independently, and a wireless version (complete with aluminium base and the same key design) should be available in the UK soon, once clearance has been obtained from the FCC. The wireless version has a narrower, more compact key layout and no USB ports. We found the transition from old keyboard to new a painless one, and had no problems with "muscle memory", as some on the internet claim. Gone are the raised keys of old; in their place come flat keys that look and feel almost identical to those on a MacBook. The weight required to press them is now a fraction of what it used to be. In practice, this means faster typing and less wear on the finger joints. And because the keyboard is slimmer than an Apple Remote, and thereby practically flat with the table-top, little wrist elevation is required. This is all for the good. It's a sleek solution to a common problem and one that makes all those keyboards with chunky wrist rests look blunt and ineffective. Raising the board off the desk is just a single bar, the height of a USB port. Two USB 2.0 ports are built into the board as standard, one at each end. These are faster, better-powered updates than the USB 1.0 ports of the old board. Another benefit: the keyboard doesn't produce any heat, and there are no sharp edges to deal with. It's also easier to clean. Food and fluff has nowhere to go. The keys sit almost flush with the board, which makes it possible to wipe clean with a cloth. One caveat: if you're going to upgrade your keyboard but not your Mac, remember that you'll need to update your keyboard driver to ensure the new keys and layout are fully supported. If you don't do this, some of the new keys won't work. We found the process a little bumpy: the first download of Apple's Keyboard Update 1.0 wouldn't unpack on an iMac G5. The 1.1 update worked fine, though. The keyboard only works with Mac OS 10.4.10 and above. Apple has added three new function keys, bringing the total up to 19. You also get new Dashboard and Expose shortcuts, and superb track-browsing keys for playing, pausing, rewinding and fast-forwarding video and audio; these work really well in iTunes. Our verdict? We can't think of a more ergonomic tool for typing that's so easy to clean and boasts such a great range of key functions.